Here you will find all of your Industrial Dust Vacuums needs. We carry multiple/all brands and types, such as pulse vacuums & dust vacuums. If you can't find something that you're looking for, please give us a call at 1-800-227-8479. TCS™ Equipped - The industry's first Tank Capacity Sensor is optional on all Series-1000 models. Provides both visual and audible warnings when the collection chamber reaches capacity. • Inlet size ( inches ): 2"
Unlike other industrial vacuums, the A-101 Pulse-Vac is designed specifically for the removal of fine dust and powders without clogging. 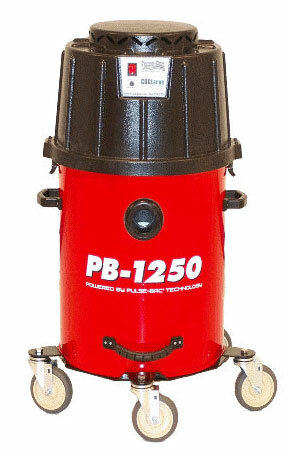 By using time tested proven technology of compressed air to pulse clean the filter (which has become the most efficient means of cleaning filters), the A-101 Pulse Vac is the only portable vacuum in the market to use a compressed air pulsation system to continually flush the dust and debris. The A-101 Pulse Vac is perfect for clean up around job sites or as a dust collection system for your surface preparation equipment. The Pulse Vac is designed with a lower center of balance to prevent tip over and a powder coated 16-gallon steel drum for easy dumping. 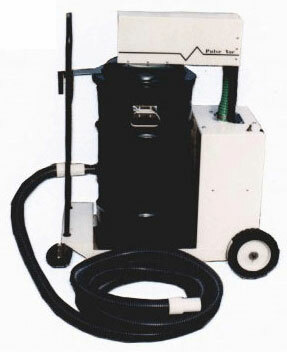 The A-101 Pulse Vac operates on a standard 110 volt 20 amp outlet, creating 110.0 CFM with 123" of lift. After being in production since 1996 with thousands of satisfied customers, we have such confidence in the performance of our A-101 Pulse Vac that we are only manufacturer to offer a money back guarantee*. The KleanRite "Reverse Flow" vacuum systems are capable of maintaining constant cfm. This allows you to keep your production time up and your downtime down. The cartridge filters are sequentially pulsed with a burst of air every 7 seconds from the blower exhaust chamber. This self-cleaning filter process ejects all dust/debris from the surface of the filter allowing a continuous flow of air. Many vacuums lose their ability to keep up with the particulates while it is collecting fine dust such as: concrete dust, wood dust, terrazzo dust, marble dust, drywall dust, powder coating dust, fiberglass dust, industrial dust collection, and much more. The KleanRite™ dust collection system is also ideal for decorative concrete clean-up; drum sanders for wood sanding and most other type of floor prep. • Patent Pending "Reverse Flow" automatic filter cleaning technology. • Donaldson Torit Ultra-Web® filter technology. • One of a kind debris removal valve. We made it easy and safe. • Continuous suction is a standard feature. • Aluminum construction eliminates corrosion and reduces weight. • Innovative electrical system protection. • Spacious design for effortless maintenance. 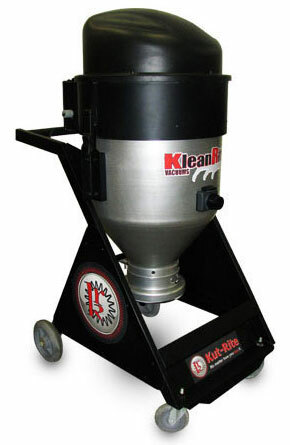 The KleanRite™ RF32 "Reverse Flow" vacuum systems feature two motors and are capable of maintaining constant cfm. This allows you to keep your production time up and your downtime down. The cartridge filters are sequentially pulsed with a burst of air every 7 seconds from the blower exhaust chamber. This self-cleaning filter process ejects all dust/debris from the surface of the filter allowing a continuous flow of air. Many vacuums lose their ability to keep up with the particulates while it is collecting fine dust such as: concrete dust, wood dust, terrazzo dust, marble dust, drywall dust, powder coating dust, fiberglass dust, industrial dust collection, and much more. The KleanRite™ dust collection system is also ideal for decorative concrete clean-up; drum sanders for wood sanding and most other type of floor prep.